Hocus Pocus is a 1993 American comedy horror fantasy film directed by Kenny Ortega, starring Bette Midler, Kathy Najimy, and Sarah Jessica Parker; written by Neil Cuthbert and Mick Garris, and based on a story by Garris and David Kirschner. It follows the villainous trio of witches, who are inadvertently resurrected by a teenage male virgin in Salem, Massachusetts. 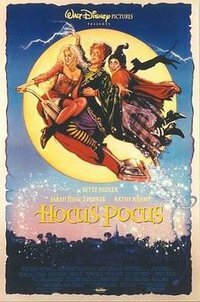 Although it was not a critical or commercial success when first released, Hocus Pocus has become a cult film, largely from annual airings on Disney Channel and Freeform (formerly ABC Family). • Bette Midler: 'Hocus Pocus' movie remake will be "cheap"
This webpage uses material from the Wikipedia article "Hocus_Pocus_%281993_film%29" and is licensed under the GNU Free Documentation License. Reality TV World is not responsible for any errors or omissions the Wikipedia article may contain.